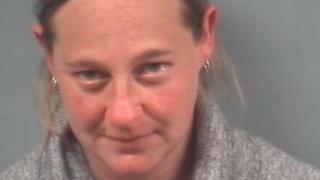 A former dinner lady who was spared prison after being found guilty of sexual activity with a child has now been jailed after her original sentence was overturned. Terri Spragg, 35, of Bettesworth Road, Ryde, Isle of Wight, was found guilty of seven counts of sexual activity with a child under 16 in December. She originally received a 15-month sentence, suspended for two years. The Court of Appeal has now jailed her for three years. Solicitor General Robert Buckland QC MP described the original sentence as "unduly lenient" and referred the case to the Court of Appeal. He said Spragg engaged in a series of sexual activities with the victim between 12 August and 1 November 2014, when he was 14. The mother-of-four was caught after the victim's sister discovered messages on his phone, he added. Speaking after the hearing on Thursday, the solicitor general said: "Gaining a child's trust and abusing it in this way is unacceptable. "The original sentence failed to take proper account of the seriousness of the offence and the impact it has had on the victim and his family. "I hope the court's decision to impose an immediate prison sentence sends a clear message to society that such offences will not be tolerated."